Advice on how to ensure your heavy duty truck engine doesn't boil over or over heat under the hot summer sun. The old saying goes: Be careful what you wish for. For many fleet managers who wished for one of the harshest winters on record to be over, the onset of summer heat brings with it some relief but also a new set of challenges. Truck fleets that traverse the North American continent this summer, spanning regions from the northwest to the southwest and both coasts, know that one of the few constants among those thousands of miles of pavement will be stifling heat and oppressive humidity. With the primary goal of delivering a contracted load from Point A to Point B, fleet managers know they cannot control the weather in any region or on any route. The best they can do is prepare their vehicles to withstand whatever the road throws at them. It is easy to see that no matter where you are located you need to be prepared for the weather extremes that may occur. Extreme heat puts extreme stress on a heavy duty truck and its engine. The primary source of protection from heat is an engine’s antifreeze/coolant (AF/C). 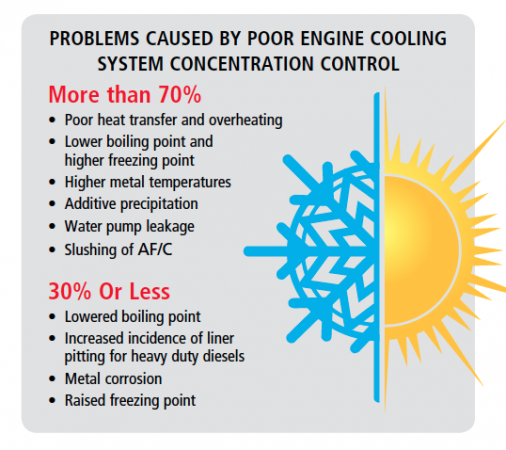 Fleet managers understand that effective engine cooling system maintenance is their frontline defense against summer’s relentless heat, and it requires a proactive approach to testing and maintenance. The engine cooling system controls the operating temperature of an engine, and today’s heavy duty diesel engine runs hotter than ever. An engine running too hot or too cold will affect longevity and performance of oil and its viscosity, which can lead to increased wear and tear on the engine and negatively affect fuel efficiency. Now that it is summer, how did that decision to add additional antifreeze concentrate during the winter affect your summer heat protection? 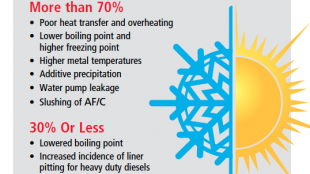 By increasing the percentage of concentrate during winter, heat exchange properties of the AF/C are compromised and can lead to engine component troubles in the summer. A disproportionate ratio of AF/C to water in the mix can mean the heat exchange between the AF/C the engine cooling system will not be efficient, putting additional stress on the cooling system components that could lead to premature failure. This can also lead to additional stress on the other functional fluids under the hood, including engine oil as well as transmissions and power steering fluids. In some cases inhibitors can precipitate out and expose metal components of the engine to premature wear and potential failure. The modern heavy duty engine is equipped with a myriad of lightweight metal components such as heat exchangers, water pumps and EGR coolers, which are all impacted by higher operating temperatures. Given these potential problems, OEM recommendations should always be consulted. A general recommendation of a 50/50 ratio will provide the system a boiling point up to 265°F. Above a 5,000-foot elevation, AF/C should be maintained at a 55-60% concentrate-to-water mixture to reduce the chance of boiling over. To optimize the performance of the specially blended inhibitors in an AF/C, it must be accurately diluted with a good quality water. Beware, water quality can vary depending on the source and timing throughout the year. In some locations it can be extremely difficult to find a water source that would meet the TMC and other industry recommendations. Test strips can be used to test water quality including hardness, pH and chloride levels. Measuring and maintaining the concentrate/water ratios within an engine cooling system can help ensure optimum engine operational efficiency. Ratios can be measured a number of ways including a hand-held refractometer, a hydrometer, or test strips. The challenge for the fleet manager is that these measurements only ascertain whether boil point and freeze point protection are correct; it does not indicate the level of inhibitor protection. Test strips are designed to test AF/C inhibitor levels in a vehicle’s cooling system. Qualified independent testing laboratories are another option to determine the exact condition of a AF/C sample. The primary focus when checking the engine AF/C quality in a heavy duty diesel engine is to guarantee the concentrate and water ratios are correct and will provide boil-over protection. 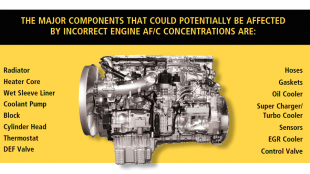 To avoid costly repairs, vehicle downtime and the loss of valuable revenue, invest in quality AF/C products and a AF/C maintenance program that protects your engine year round. Colin Dilley is the vice-president of technology for Prestone Products Corporation. CAN YOUR DASH CAM COST YOU YOUR FAST CARD?